A full house at Old Bakery Beer Co.
A commemorative glass was given to each person who bought a ticket to the fest. 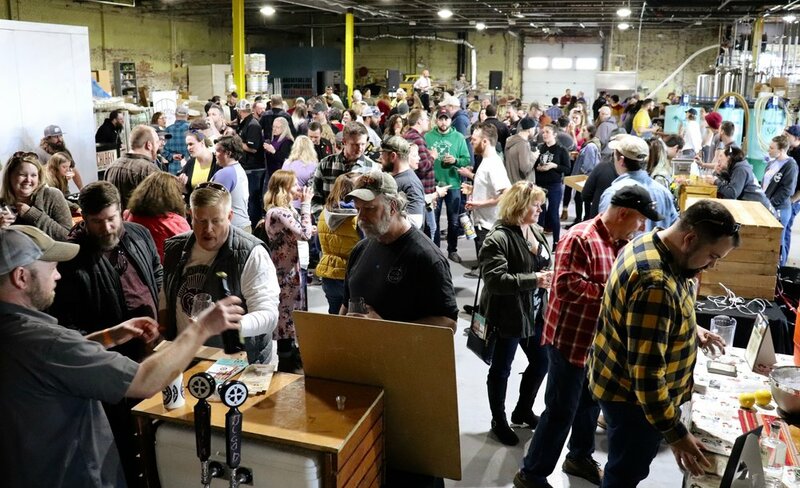 Alton’s very own microbrewery, Old Bakery Beer Co., organized the high-spirited Buzz’d Beer Festival in celebration of its fourth anniversary March 31, 2019. From 1 to 5 p.m., beer lovers from the local area and beyond strolled around the premises drinking tasty beer, eating yummy food and listening to groovy tunes played by Echo Base Quartet, a local band from St. Louis. Echo Base Quartet plays during the fest. Artisan beers, ciders and liquors at the event all came from local businesses wanting to help support the recognition of the importance of pollinators because without them, favorite local brews would disappear. Alton’s local Piasa Palisades Sierra Club chapter teamed up with OBB to create an enjoyable celebration where 10 percent of the profits go toward the influential Sierra Club, who is a major component in raising awareness of the importance of taking care of our Earth. The crowd gathers in the brewery for fun and support of pollinators. 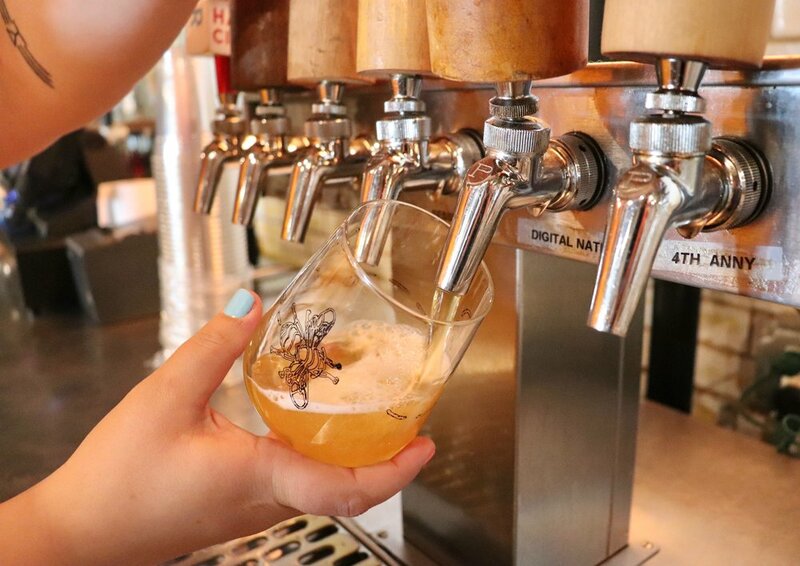 Talking with a local brewery, Hopskeller Brewing Company (Waterloo, Ill.), I found out just how important pollinators are to the cycle of food and drink. Ana also informed me beetles are the main source of pollinating, but we focus on bees because they are less sturdy and can be exterminated a lot easier. “Bees are affected an entire hive at a time,” Ana said. “If the area around the beehive is affected by pesticides, a fungi or mites, then that entire hive is just gone. It doesn’t take much because bees are not very hardy.” Really sad, right? Not only is OBB trying to bring to light the importance of pollinators and how we as humans need to be more mindful of our actions that negatively affect pollinators, but they also want to spread awareness on the significance of sustainability, especially in a business setting. Pollution not only damages pollinators, but all people as well. Left to right, Darrius Spangler and Austin Hayden, employees of OBB, enjoy a toast to beer and bees. I sat down with Lauren Pattan, one of the hardworking people who runs OBB, to chat about the brewery’s sustainable practices. When sourcing items for the restaurant, Lauren said they buy as many post-consumer items as they can, such as paper products and to-go ware. In addition, during the main growing season, the kitchen uses as much locally sourced products as they can. Practicing sustainability is not always easy within our consumerist society, but thank you to OBB for setting a positive example for other businesses and individuals around our community. Overall, this excellent celebration showed how supportive the surrounding areas are of local ambition and craft. Not only do we take pleasure in community events, but also quality beer. It is safe to say that everyone in attendance was buzzing with joy (and brews)!